Believe it or not I've had this hi-lighter blazer for months now- purchased in the peak of the neon trend season- and this is the first time I'm wearing it! I know, I don't know how I passed over this brilliant jacket in lieu of something more subdued time and time again, either. While I have no problem pairing this neon hued piece with a flamingo printed skirt, or leopard cropped pants, I choose to go with a basic grey canvas to highlight (pun intended) the jacket and a multitude of accessories that I seem to not be able to go without. How do you do the neon trend? I'd love to hear more suggestions on how to wear this piece? Love the jacket! It would look great with some bright shoes...like hot pink pumps! Great choice. I love every single piece ! Gorgeous look. I love the neon. 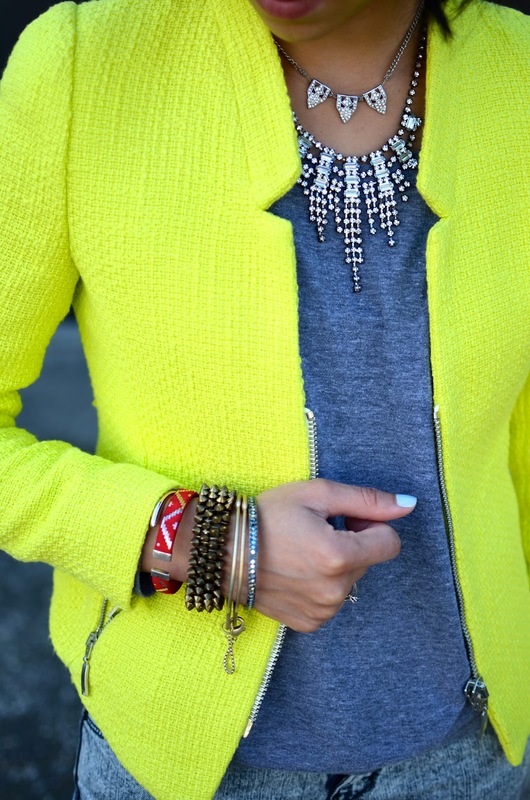 Love the super brightness & your bracelets too! o i love it! that shade of yellow is sooooo good with grey! pastels and neon look good together too. This is the FIRST time you are wearing it?! Holy moly Carlina, I am shocked! I probably would be wearing this thing to shreds lol. I love how you paired it though and those boots are. ba-nan-as!!! And did you cut your hair? It's so cuuuuuute!!! I love your neon jacket! I love the bling you paired with the jacket too! i always find bunch of clothes from last year that haven't been worn, lol!! absolutely love the way you styled this gorgeous neon blazer, i think it goes perfectly with basic, love your necklaces too!! I still love a pop of neon despite that fall is here, your outfit is gorgeous with the neon yellow and deep grey tee, plus I love the sparkles - you know me! love that blazer with the necklaces!! Gorgeous girl! Love the jacket! THis jacket is fabulous :D You look great! I LOVE that neon yellow color! I almost bought a shirt in the hue this weekened and didnt... now I'm kicking myself for not getting it! Anyhoo I'd love to see you mixing it up with print (like you do so well!) ... printed pants maybe?